To introduce these four new books by one particular publisher I wanted to explain – in case ya hadn’t noticed – that we carry all manner of publishers, large and small, faith-based and otherwise, like any full service bookstore. We’ve got some general market best sellers, most of the popular religious best-sellers, but, better, a strong backlist of all kinds of good stuff, from across the faith-based publishing universe and beyond. We’re a little quirky and wanted to brag about our different publishers so I found myself describing a dozen houses, and some of their books. Man, talk about a tangent, before we even got out of the gate. Sooooo, I deleted that so we can get right to it. Eerdmans and their sales reps serve us well and we want to shout out to them alongside the other publishers whose books we carry. Without these publishing houses vetting and marketing thoughtful works, the religious publishing industry – wild and wooly and often infuriating as it is — would be a really hot mess. We are grateful for the considered and valuable books classy publishers like Eerdmans bring to the marketplace. Theirs are almost always books worth knowing about and often well worth owning. Here are four brand new Eerdmans releases that came in this week. They are among the most important religious books of the fall. You can order any of them at our secure website order page by following the link below. Just type in what you want and we’ll follow up promptly. All of these are 20% OFF. 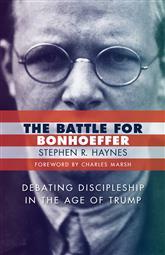 The Battle for Bonhoeffer: Debating Discipleship in an Age of Trump Stephen R. Haynes (Eerdmans) $19.99 I haven’t read this yet but you may guess right from the start what it is about, and many Hearts & Minds friends are going to be interested. Yep, it is – among other things – about Eric Metaxas and his own work on and recent use of Dietrich Bonhoeffer, the great German Lutheran who called us to “the cost of discipleship” and was executed for his resistance to the Nazi regime. 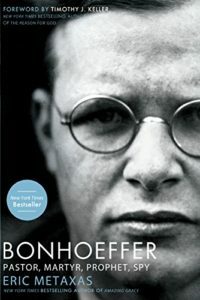 You may know (I hope you do) Mr. Metaxas’ exceptionally readable, evangelically-minded, major biography entitled Bonhoeffer: Pastor, Martyr, Prophet, Spy: A Righteous Gentile vs. the Third Reich (Thomas Nelson; $19.99.) Like his previous Wilberforce bio (Amazing Grace) and his more recent book on Luther, Eric has brought the drama, historical background, arcane details and big picture vision of major historical characters to a popular level with his captivating prose and robust storytelling. (His smaller, but thrilling, 7 Great Men and 7 Great Women are coming out in a single volume later this fall!) Metaxas is a clear, colorful writer, a passionate thinker, and his Bonhoeffer book is massive; that’s a good thing, in this case, as there is so much to say, and he says it so well that many a reader wished it wasn’t over, even after 600 pages! There are a lot of books out there by and about Bonhoeffer and there is little doubt that Metaxas’s has sold more than any other. Two things you must know, though, things we routinely chat about with those who are interested in buying Bonhoeffer: Pastor, Martyr, Prophet, Spy… what I sometimes call Metaxas’ BBB (Big Bonhoeffer Book.) You see, not everybody likes it. First, not just a few historians and Bonhoeffer scholars have insisted that Metaxas is a sloppy historian. He’s got a line or two mistaken about a historical episode in a book he wrote about the Founding Fathers. Maybe there is another Wilberforce book that is more tediously correct about everything in 18th century England. I suppose some disapproved of something in the Luther book but it was by far the most engaging one I’ve ever read about the great monk with a mallet. Some think he sacrifices facts for writerly color and eloquence in an attempt to be inspirational. Such claims don’t worry me much, to be honest, as he isn’t vying for best academic study of his topic: he’s a popularizer, I suspect he knows that, and, at that, he’s a good one. Of course if he were exceptionally inaccurate with the facts or out and out ridiculous (think of the likes of David Barton) we’d be concerned. But I’m not too interested in nit-picking a books like these that gets thousands of people interested in somebody like Wilberforce or Bonhoeffer or Luther. But the second thing to know isn’t just whether Metaxas is fully accurate and impeccable as a popular biographer and history-writer. The second thing to know is that many think that Metaxas is fundamentally wrong about his understanding of Bonhoeffer’s faith and how to learn from him in our current socio-political climate. In other words, there is a concern about Metaxas’s reading of Bonhoeffer and his use of Bonhoeffer. The Battle for Bonhoeffer is not only about Metaxas, but telling about this part of it is a way into Hayne’s overall project in what seems to be a very impressive and important work. Ends up, Metaxas – who is, did I say, one hell of a writer – with a degree from Yale, makes a pretty good case that Bonhoeffer did have something akin to a born-again experience while in exile from Hitler’s Germany. Strangely warmed, Bonhoeffer himself wrote specifically about it during his stay in New York where he studied, seemingly unhappily, at Union Theological Seminary but worshipped with black Christians in Harlem, about which he wrote piously. He took black gospel records back to Germany and they inspired him and his underground seminary movement until he was executed by the Fuhrer in 1945. Those that read BookNotes (heck those that read my opening paragraph) know we’re pretty ecumenical and open-minded here, so I do not care as much as some if Metaxas is right or not. Bonhoeffer can be read and understood in the context of German liberal theology, mainline Lutheran Protestantism, or as more in keeping with historic orthodox Christianity as represented by evangelical thinkers. I think it is an open and good debate and I love getting liberals and conservatives, mainline folks and non-denominational ones, together to talk, even if it is a debate about who has the right to claim Bonhoeffer as their own. In The Battle for Bonhoeffer Stephen Haynes – who thinks Metaxas radically misunderstands Bonhoeffer and “appropriates” him for his own (conservative and even pro-Trump) political agenda — gives us the context for this debate and gives us the first book-length assessment of how Bonhoeffer has been received and understood since the post-war years and up until 2018. Analyzing Metaxas and his book and Metaxas’ subsequent project of marshaling Bonhoeffer for conservative Protestantism and its social agenda is only part of Battle for Bonhoeffer, but, oh, man, is it an interesting journey. And Metaxas’s project does, it seems to me, go haywire, as Eric gets involved with Fox News, links pro-life activism and the courts’ antagonism regarding religious liberties to our “Bonhoeffer moment” starts a largely right-wing radio show and now is an outspoken acolyte for President Trump. Haynes (and anyone who writes about this, and all of us readers) must differentiate, I think, between two things: we must ask firstly if the Bonhoeffer book is mostly right, on the face of it, and separate that from whatever we may think of Metaxas’s conservative politics, his outspoken pro-life views, and his oddly incongruous support for President Trump. Like him or not, an evaluation of his 2010 Bonhoeffer is not the same as a referendum on Eric’s 2018 politics. It’s simple: we should review the book on its own terms, and not skewer our views of the book by ad hominem attacks about other stuff the author has said or done. Metaxas’ BBB (big Bonhoeffer Book) should mostly stand or fall on its own merits, not on whether you now like Metaxas or not. And similarly, if folks with whom you disagree can marshal a strong case against the historical and theological substance of Metaxas’s Bonhoeffer) then we should listen to them, even if we don’t like their other political or theological views. We dare not disregard sound academic or theological critique of Brother Eric (even if you like him) because the critic is from a camp you don’t like. I like Eric a lot, although I don’t know him well and have be disappointed my many of his public comments. I disagree profoundly with many of his current positions and am frustrated by some of his public demeanor. I think he knows this. Still, the question is important: is the big Bonhoeffer book of Metaxas, on the face of it, right and readable, more or less? Every book has small details that are in error, but, given a relatively generous reading, is he mostly right and is he readable? If he’s significantly wrong, of course, then its popularity and vivid readability isn’t good, as it captivates readers and pulls them into a wrong-headed story. (On the other hand, while I’m at it, we surely know that a book can be pristinely perfect and if it is tedious or arcane or haughty or boring – as most books about Bonhoeffer are, if you ask me – then its accuracy or bold insight isn’t that valuable, since nobody reads it anyway.) Accuracy, wisdom, and enjoyable readability must combine to make a truly great book and I want to know the opinions of scholars who really care about Bonhoeffer; it is my hope that this new paperback by Haynes will be a helpful guide to some of this. I am less interested in those who are spiteful or jealous or who are in principle in opposition to evangelical faith, ruling Eric’s book out a priori. I am told that Haynes helps us sort through all this. The figure of Bonhoeffer has become a clay puppet in modern American politics. Secular, radical, liberal, and evangelical interpreters variously shape and mold the martyr’s legacy to suit their own pet agendas. That may be overstating it, as if differing views are crassly, intentionally, misinterpreting and misappropriating. I’d rather suggest that various theologies and even worldviews of various readers are influential in such a way as to facilitate differing interpretations, sincere misreadings, more-or-less internally coherent interpretations that are each based on fundamentally different presuppositions and hermeneutics. I don’t mean to say every reading or interpretation is equally valid, but it isn’t just that a few bad guys misuse a person like Bonhoeffer for their own “pet projects,” or not usually, anyway. I don’t think we should be cynical about this. Anyway, understanding how this appropriation thing works is itself a main theme of this book, and it’s so, so important – beyond this case study of Bonhoeffer and his fans. Does it matter how Bonhoeffer is read in America? Anyone reading Hayne’s meticulously researched book will discover that it matters a great deal. Of course, Eric Metaxas is not the only one to call us to a “Bonhoeffer moment.” Eric uses Bonhoeffer in support of a bold commitment to certain conservative stances in an increasingly secularized culture that is hostile, or so it seems, to traditional Christian views. But the cultural and religious left use Bonhoeffer, too, drawing on him for their own justice agenda. They think, of course, that Bonhoeffer titled left – willing to die as he bore witness against fascism, standing with the marginalized and oppressed. Many (myself included) who have voiced strong criticisms of the way fundamentalist and some evangelical Christians have given so much unqualified support for President Trump – who just today announced cutting refugee resettlement numbers — have wondered if Bonhoeffer (and the blunt confession of the Lordship of Christ found in the Barman Declaration, written against the Fuhrer in Germany with input from Bonhoeffer) could help us repent of foolish support of this Administration’s bad leadership and bad policies. So this new Eerdmans book is asking about all of that, how the great life of a great thinker and faithful pastor might motivate us to be faithful within the quandaries and challenges of our own civic life these days. Battle for Bonhoeffer closes with what Professor Haynes entitles “Your Bonhoeffer Moment: An Open Letter to Those Who Love Bonhoeffer but (Still) Support Trump.” It is going to generate discussion, I’m sure. The Battle for Bonhoeffer: will inform you about Dietrich Bonhoeffer, it will help you understand the different interpretations and schools of thought that have used (or rejected) or adopted him, and, in so doing, will press the question of how this sort of engaged, public theology might inform us for our own faithfulness in these times. The subtitle seems appropriate: Debating Discipleship in an Age of Trump. Click here for a great short piece “5 Questions with Stephen R Haynes.” Then come back and order the book from us! 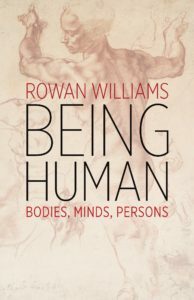 Being Human: Bodies, Minds, Persons Rowan Williams (Eerdmans) $12.00 Many of our BookNotes readers will at least know who Rowan Williams is. For those that might not yet be familiar with him, he’s a very important British theologian, an Anglican priest and thinker who a few years ago was the worldwide Anglican communion’s closest equivalent to a figurehead, their Archbishop of Canterbury. After being the 104th leader to be elected to Archbishop of the Church of England (from 2002 – 2012) Williams has become the Master of Magdalene College at the University of Cambridge. He has written widely, in varied themes from St. Augustine to contemporary politics, from linguist theory to contemplative spirituality to the study of history and why it matters. It is amazing the sorts of things he is able to write about and everyone who relates to him is impressed with his humility and congeniality and his deep knowledge of the broad, global, Christian tradition. He is a pastor/scholar and a globally recognized public intellectual. 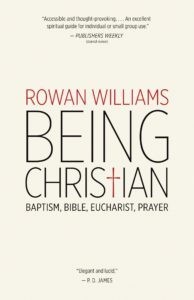 A few years ago Eerdmans started a little series of books by Rowan Williams and Being Human is the third in the trilogy. The first two were quite popular and remain good sellers in the right circles, ideal for those who want a succinct, intellectually stimulating introduction to basic Christian truths as understood within the broadly mainline denominations. 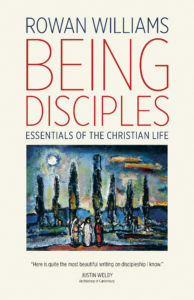 The first was Being Christian: Baptism, Bible, Eucharist, Prayer (Eerdmans; $10.00) and the second was Being Disciples: Essentials of the Christian Life (Eerdmans; $10.00.) This brand new third volume – Being Human — continues this style of gracious, engaging prose about the things that matter most. Alas, this one may not be quite as appealing, but we can sure hope that it is – after the knowledge of God and knowing what it means to be a follower of Jesus, what could be more important than knowing who we are? It is said by many great writers and thinkers – my friend Steve Garber comes to mind, immediately, but also black activist Lisa Sharon Harper and culture-maker Andy Crouch and “wounded heart” therapist Dan Allender – that most of the big questions (in philosophy, politics, ethics, science, and certainly in the arts and literature) emerge from our understanding of the human person and the human condition. 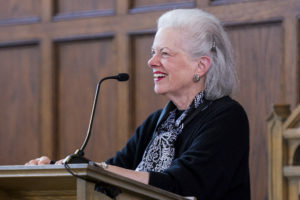 Of Walsh & Middleton’s famous four worldview questions described in their classic Transforming Vision the second foundational question is “who are we?” Some use the technical phrase “anthropology” for this – the study of the human person — and theological anthropology is a hot scholarly topic these days. It shouldn’t surprise us, then, that the Rev. Dr. Williams jumps into this discussion because, again, he seems to be nearly an icon (wait, he has a book on icons!) for socially-relevant Christian thinking; ancient truths for contemporary living, public theology for the common good, etcetera. Offering coherent, thoughtful, Christian wisdom for thinking about things like contemporary science, human origins, medical ethics, the nature of bodies, and such, is so, so needed. In this deeply engaging exploration of what it means to be human, Rowan Williams addresses such questions with lucid meditations that draw on insights from neuroscience, philosophy, psychology, and literature. He then probes the relations of faith to human flourishing and shows how a traditional Christian practice – namely, silence – can help us realize our fullest human potential. Well, I bet you didn’t see that coming, did you? I didn’t. Here is a book by a public intellectual deeply rooted in faith and theology writing about the meaning of consciousness and raising questions about whether the mind is merely a machine. What makes us a person, after all? What does it mean to be embodied? What is the relationship between our bodies and our minds? And he ends up talking about silence. Well, like I said, Being Human by Rowan Williams is short and lucid and really, really stimulating. Happily, I notice he draws on the wonderfully big ideas of The Master and His Emissary by Ian McGilchrist. He quotes Kierkegaard and neuroscientists and practitioners of silence like Maggie Ross. I think some of these chapters were adapted from lectures (at places like St. Andrews and Durham and Westminster Abby) so they are necessarily meaty, but elegant. Like the others in the trilogy, it weighs in at not much more than 100 pages. This is a really nice book for anyone curious about this huge question, for readers who want sagacious ruminations on what it means to be a person by the beloved former Primate. Many loved Being Christian and Being Disciples and, now, will want to add Being Human to complete the set. To learn that Dr. Marsden has been re-working an older textbook, updating and making it more popular, even calling is a “brief” history (I suppose the term is relative, with this being over 275 pages) it was just music to my ears. We are so thrilled that it is now released and we are counting on our astute Hearts & Minds fans and BookNotes readers to pick this up. What a hugely important thing, this study of the relationship between history and cultures and cultures and religion… How did faith (and whose faiths?) shape US history? How do we understand and appreciate the flow of one era in American history (so to speak) to the next? What is at the core of American culture, and its relationship to religiosity? Why is America so religious and yet so oddly, well, not. You see, this is about the grand shifts and undercurrents, the flow of ideas and how they influenced cultural customs and trends and values. This, I believe, is a book that will illuminate our own days and the trends of our times. While Americans still profess to be one of the most religious people in the industrialized world, many aspects of American culture have long been secular and materialistic. That is just one of the many paradoxes, contradictions, and surprises in the relationship between Christianity and American culture. In this book George Marsden, a leading historian of American Christianity and award-winning author, tells the story of that relationship in a concise and thought-provoking way. 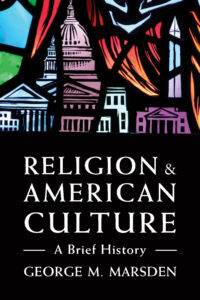 Surveying the history of religion and American culture from the days of the earliest European settlers right up through the elections of 2016, Marsden offers the kind of historically and religiously informed scholarship that has made him one of the nation’s most respected and decorated historians. Students in the classroom and history readers of all ages will benefit from engaging with the story Marsden tells. As the title to my book suggests, this story focuses on the mutual interactions between the major religious forces in American history and the broader cultural forces. Though it provides the basic information necessary to understand the differences among the various religious dynamics, it is not a conventional religious history that focuses mostly on religious institutions, and on the details of their leadership, theologies, programs and developments. Rather it is my attempt, drawn from over a half century of reflection on the fascinating religious and cultural interactions, to put the story in a helpful interpretive framework. The United States is an amazingly religious place. Yet it is simultaneously a remarkably profane and materialistic place. Trying to understand that paradox provides one of the central and most fascinating themes in this analysis. The culture reshapes the religion even as the religion helps shape the culture. So I include a good bit of material attempting to draw on the best insights into the cultural dynamics and intellectual trends and assumptions that have been most characteristic in various eras of American life. 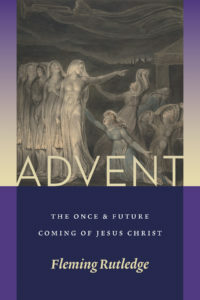 Advent: The Once & Future Coming of Jesus Christ Fleming Rutledge (Eerdmans) $30.00 I wish I had more time to spend some time with this so I could tell you the glories of it. I’m afraid I am going to have to be very brief, because I just can’t imagine how to explain this other than the bare basics. 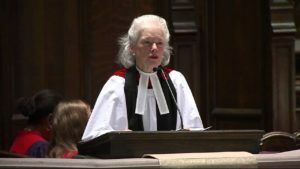 You know, I hope, that Fleming Rutledge is nothing short of a hero to many – thoughtful, intellectually stimulating, a rigorous scholar and, until recently a working pastor in her Episcopal parish in New York City. My favorite book of hers is a remarkable work to read during Lent called The Undoing of Death: Sermons for Holy Week and Easter. Like that one, Advent: The Once and Future Coming of Jesus Christ is largely a collection of sermons preached over a lifetime of Advents, a collection selected and well edited, making it a major contribution to Advent materials; this nearly is a publishing event! However, there are some extra delights in here as well – four solid chapters which were originally essays or articles, such as a five-part Advent series that appeared in the Christian Century (I had clipped some of those!) and there are several of what she calls “Pre-Advent.” There are a few on “God’s Apocalyptic War” which were preached on the Feast of Saint Michael. At the conclusion there is a Service of Lessons and Carols on the Great “O” Antiphons. I can’t wait until the right time of the year to read that, starting, I might add, on page 393. Whew, what a fabulous collection, a book that you will use for years to come. I can’t list all the many, many sermons, even the groupings, but I can assure you they are vivid, meaty, and move us to be active in awaiting the coming of the King – the in-between times of “already but not yet.” These are surely striking, gutsy, Biblical and potent. I waver to suggest there is nothing like it in print.